pursuant to LA R.S. 9:2795.1." This law has been challenged and upheld. 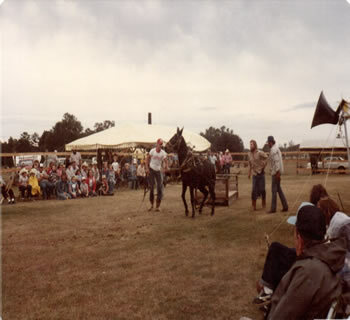 In May of 1973 the Louisiana Draft Horse Assocation was founded to promote family fun and entertainment, while restoring and re-enacting the uses of our forefather's main source of power - the horse! The original group, made up of 9 familiy units, quickly grew to 18 family units within the first few years. Family units were emphazied with the idea that today's family can work and play together by sharing in these activities, even as they did in yesteryear. At first these draft horse enthusiasts would get together on weekends to see what they could do with their horses. As the draft horses were new to this part of the country, interested people would come and see what they were all about. As more and more people came, the idea evolved into Old Farmer's Day! After a few years the other members of the Louisiana Draft Horse Association decided they didn't want anything to do with the event, so the Brunett Family took the reigns from there! So why October? Most visitors don't fully grasp the concept of why we host this event every year, but more specifically why exactly we hold it in October. Well the answer lies here....Old Farmer's Day is actually a national holiday! That's right, October 12 is a day devoted to old farmers and their farming techniques. Agriculture and farming today is largely mechanized and very scientific, but these developments would not have been possible without the wisdom and hard work of old farmers. While the origins of the holiday are unknown, Old Farmer's Day is celebrated by many across the nation as a throwback to sustainable and farm-to-table farming practices of the old days. This day is to give them thanks, to listen to them and to their stories, and to learn from them and their techniques. We strive to do this very same thing year after year, hence the reason we chose October as the time for our celebration! In the early 1990s a piece of family history was reguvinated, when the very kitchen Gerald's father built in 1904 became the center of attention at Old Farmer's Day. Old Farmer's Day • ©2015 ALL RIGHTS RESERVED.